Let Mother Nature Do the Work! Composting is Mother Nature’s way of taking care of her own “garbage”. Fallen leaves, fruits and dead tree branches all decompose naturally producing a rich soil called humus that nourishes living plants. Like Mother Nature, we can take care of our own organic garbage and do it in our own backyards! 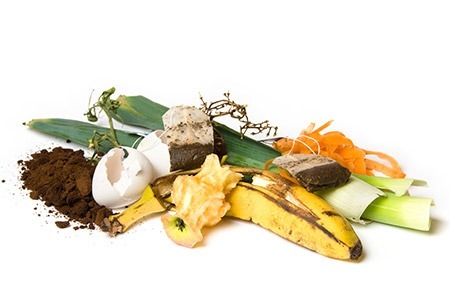 Items such as fruit and vegetable peels, coffee grounds and filters, tea bags, eggshells and grass clippings make up almost one third of the garbage we put out at the curb every week and all these can easily be transformed from “garbage” to “gold mine” in a backyard compost. Hey, you paid for the whole fruit – why throw a third of it away? Whether you build your own or buy one at your local hardware store, all it takes is a few extra minutes to collect your kitchen scraps in a plastic container and empty them into your backyard composter. That small walk each day can make a world of difference – by reducing the amount of garbage you send to landfill, you help protect our environment and the natural beauty it holds for future generations. You also produce a valuable soil conditioner that you can share with all your gardener friends… and the walk is good for you too! Composting is essential for everyone to practice. Reducing waste by up to 30% is vital to protecting our environment. Every little bit counts and it all adds up. Let’s all do our share and compost! Gradually release nutrients necessary for growing plants. Insects and diseases don’t do as much damage where soil is enriched with compost. Dark compost draws the sun’s rays to warm the soil, extending the growing season. Compost added to soil acts like a sponge, soaking up excess water during rain and releasing it during dry spells. Compost improves the structure of sand and clay soils, protecting them against drought and erosion. For more composting tips and how-to’s, please visit the Greater Miramichi Regional Service Commission website at www.greatermiramichirsc.ca.